Get up to Code with the latest changes in the 2017 NEC®. Every three years, a new edition of the NFPA 70®: National Electrical Code® (NEC) is released, and each edition contains technical changes that reflect evolving technologies and new requirements for reducing electrical hazards. Adopted throughout the U.S. and around the world, the NEC is trusted as a comprehensive foundation for safe electrical installations in residential, commercial, and industrial occupancies. NFPA's new NEC Changes Online Training Series provides valuable learning about the major revisions found throughout the Code. 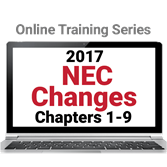 With the 2017 NFPA 70: Changes to the NEC 2017 Edition Chapters 1-9 Online Training Series, you will receive the complete set of Modules 1-18 covered in other NEC Changes Online Training courses. All modules have been designed to give you a substantial overview of revisions found in the NEC, as an affordable, convenient, and interactive experience online. Improve your ability to locate, interpret, and apply today's provisions correctly. Get up to date on the major changes in the 2017 NEC that impact design and installation and help you pass inspections. Avoid costly redos and code violations, and be confident in your work. Complete this sixteen hour course series and qualify for 1.6 CEUs. Upon successful completion, participants will be prompted to download the CEU certificate directly from the course site.